While attending Journalism school, I listend as one of my instructors talked about the importance of having “F U money.” He explained that preparing for an alternative future was vital if we wanted to maintain journalistic integrity. My instructor was talking about being able to leave a job if we were asked to do something we didn’t agree with. However, the concept also applies to creating a Plan B that you can call on in your financial life. Life is unpredictable. You don’t actually know what’s coming. My husband was told that, even though one of the universities he adjuncts for wasn’t going to hire him, he could teach at least one class a semester for as long as he wanted. Well, now that isn’t going to happen — no matter what the department head promised originally. Now that this ironclad promise has turned out to be less ironclad than originally thought, my husband is trying to figure out what to do next. He missed out on applying for some great jobs because he counted on being able to continue working at a school he liked, with students he enjoyed interacting with. You don’t know what’s coming. No matter how well you plan, or what promises have been made, things can change just like that. And you need to be ready for it. In my husband’s case, he has another university that’s already contracted him to adjunct in the summer and the fall, and he’s going to use the extra time on his hands to apply for full-time positions. But this is made possible by the fact that I am the primary breadwinner, and by the fact that our monthly bills are reasonably small, and that our mortgage is less than 1/5 our income. We can afford the lower income my husband will be bringing in. 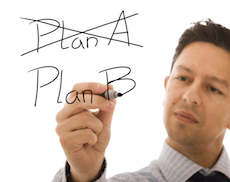 Do you have an alternative plan? If you lose some of your income, or if an opportunity you were sure about fails to materialize, would you be in financial trouble? Or do you have a Plan B? From what you would do if your life partner died, to how you would handle a job loss, you need to have an idea of what you would do next. It’s important to build your assets so that you have more financial options, and consider alternatives to what you’re doing so that you don’t get stuck in despair when things don’t go your way. I only have $500 in an emergency fund so if anything happens I won’t be telling anyone to FU, I will be looking the mirror saying you are so F’d. I am trying to build my emergency fund and think up another income stream because, as a single person, I always feel financially insecure. I live on 50% of my income and I can’t cut anymore. There are only two sources of money: your labor (job or business) or your investments. The key to independence, then, is building your investment pot. The more important this is to you, the more you’ll sacrifice ti build that pot. Good idea having a backup plan. I wiped out my emergency fund, and then never built it back up in order to pay off debt. I will be building it back up, but having a full plan is a great idea! I need to update my plan B and will today. Thanks for the reminder.